Trudi Koch has done it again! Here's a precious gift for those little ones in your life. It even has a little pocket for the tooth that magically turns into money! Trudi says everyone knows how to make a pillow! :) But if you would like her instructions, click on the sentiment below to view the text file. Then, just print from your browser and use your BACK button to come back here. 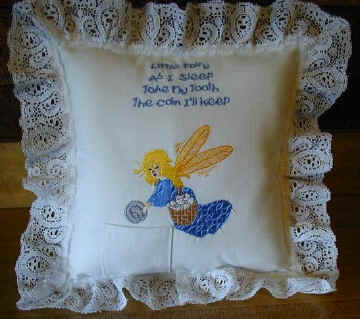 Judy Bausch sent in this picture of a wonderful tooth fairy pillow that she made for her grandchildren. Click on it to enlarge it. She makes them out of polar fleece and uses sparkle gold organza cut on the bias for the pocket. All the white is glow in the dark thread (teeth, wings, stars and lettering). She has generously shared the lettering files that she has customized for use on polar fleece. Click on the verse to download her files. 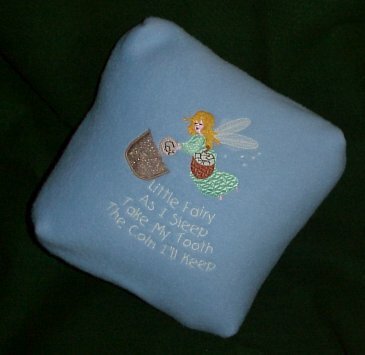 Fran Walton makes her coin pockets from an appliqué design that she digitized. to download the zip file in all formats. Thank you, Fran! Be sure to check the Sew 'n Show Page for more ideas!